You know a work of fiction is good when it is difficult to tell if the story is fact or fiction. 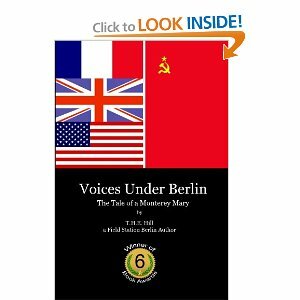 Thus we have Hill’s book, “Voices Under Berlin”. The lines are very blurred between fact and fiction in this book. The reason? The story is based on actual events with a few embellished events and people. Some of the military speak was difficult for me and I often wished my father, a military man, was still alive to explain part of it to me. My father was stationed in Berlin in the Army. Hill’s writing for me was rich enough that I will continue my research into this period of history. I loved that part of it was written in script form so you felt as if you were actually reading a transcript. From this book I gained a better perspective of the operation that took place before I was born. I have a greater appreciation for the men who served in this capacity.